This program is currently accepting referrals of Karen men age 18+ for outpatient group therapy. Click here for the referral form. ကရူၢ်လၢမၤသကိးတၢ်ဒီးကညီဖိလၢသူကသံၣ်မူၤဘှီးဒီးသံးဧိၤဂာ်ဧိၤသ့ၣ်တဖၣ် (KCDC) အိၣ်ဒီးတၢ်ဟ့ၣ် လီၤသး ဒ်သိးတၢ်ကပတုာ်ကွံာ်တၢ်အီသံးအီဂာ်ဒီးတၢ်သူကသံၣ်မူၤဘှီးလၢ ပှၤကညီတဝၢပူၤအဂီၢ်န့ၣ်လီၤ. ကညီကရၢမံၣ်နံၣ်စိထၣ်မၤသကိးတၢ်ဒီး HealthEast Roselawn တၢ်ဆါဟံၣ်ဒၢးဒ်သိးကဟ့ၣ်နီၤလီၤ တၢ်ကူစါယါဘျါဘၣ်ဃး တၢ်သူကသံၣ်မူၤဘှီးဒီးသံးဧိၤဂာ်ဧိၤ လၢအကြၢးဝဲဘၣ်ဝဲ ဒီးပှၤဘၣ်ကီဘၣ်ခဲ အိၣ်ဟဲ လၢကီၢ်ပယီၤသ့ၣ်တဖၣ်အဂီၢ်န့ၣ်လီၤ. KCDC တၢ်ရဲၣ်တၢ်ကျဲၤအံၤဘၣ်တၢ်မၤသကိးအီၤဒီးကညီတဝၢခိၣ်နၢ်တဖၣ်, တၢ်ကွၢ်ထွဲတၢ်အိၣ်ဆူၣ်အိၣ်ချ့ ကသံၣ်သရၣ်တဖၣ်, တၢ်ဘူၣ်တၢ်ဘါခိၣ်နၢ်တဖၣ်, ပှၤကျိးထံတၢ်တဖၣ်, ပှၤဂ့ၢ်ဝီအပှၤမၤတၢ်ဖိတဖၣ်, ပှၤစဲၣ်နီၤဘၣ်ဃး တၢ်အိၣ်ဆူၣ်အိၣ်ချ့လၢသးတၢ်ဆိကမိၣ်, ဟီၣ်ကဝီၤပူၤပၢၤကီၢ်တဖၣ်, ပှၤစဲၣ်နီၤဘၣ်ဃး တၢ်သမံသမိး, ဒီးပှၤတဝၢဆူၣ်ချ့ပှၤမၤတၢ်ဖိတဖၣ်န့ၣ်လီၤ. ကရူၢ်တဖၣ်ထံၣ်လိာ်သးတလါခံဘျီ ဒ်သိးကဒုး အိၣ်ထီၣ်တၢ်ရဲၣ်သဲကတီၤလၢတၢ်ကီတၢ်ခဲလၢအိၣ်ထီၣ် ခီဖျိတၢ်အီသံးအီဂာ်ဒီးတၢ်သူကသံၣ်မူၤဘှီးသ့ၣ်တဖၣ် အဂီၢ်န့ၣ်လီၤ. KCDC ဟ့ၣ်နီၤလီၤတၢ်သိၣ်လိဘၣ်ဃးတၢ်ဟ့ၣ်ကူၣ်ဟ့ၣ်ဖး (counseling) ဒီးတၢ်ကူစါယါဘျါဘၣ်ဃး တၢ်အီသံးအီဂာ် ဒီးတၢ်သူကသံၣ်မူၤဘှီး (chemical dependency treatment) ဆူပှၤကညီ တၢ်အိၣ်ဖှိၣ်ခိၣ်နၢ်ဒီး ကသံၣ်ကသီပှၤကျိာ်ထံတၢ်တဖၣ်အအိၣ် ဒ်သိးကမၤဒိၣ်ထီၣ်အါထီၣ်အတၢ်သ့တၢ်ဘၣ်ဒီး တၢ်သ့ၣ်ညါနၢ်ပၢၢ်အဂီၢ်န့ၣ်လီၤ. လီၢ်ခံကတၢၢ်တမံၤ, KCDC ဟ့ၣ်နီၤလီၤဆူၣ်ချ့တၢ်ကူၣ်ဘၣ်ကူၣ်သ့လၢ အလီၤပလိာ်လိာ်သးဒီးတၢ်ဆဲးတၢ်လၤလၢဘၣ်ဃး တၢ်အီသံးအီဂာ်ဒီးတၢ်သူကသံၣ်မူၤးဘှီးအဂ့ၢ်အကျိၤ န့ၣ်လီၤ. The Karen Chemical Dependency Collaborative (KCDC) is committed to ending alcohol and drug use in the Karen community. 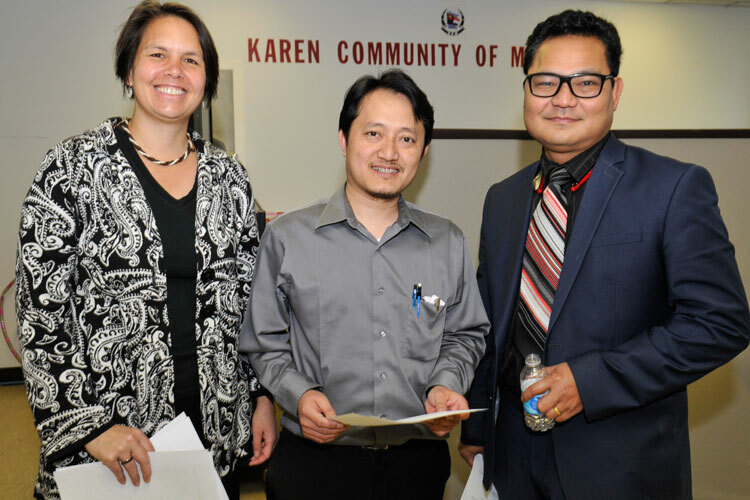 KOM partners with the HealthEast Roselawn Clinic to provide culturally and linguistically specific outpatient treatment for refugees from Burma using drugs and alcohol. KCDC involves Karen community leaders, healthcare providers, religious and spiritual leaders, interpreters, social workers, mental health specialists, local law enforcement, evaluation specialists, and community health workers. The group meets bi-monthly to develop strategies for addressing problems related with harmful alcohol and drug use. KCDC leads faith leader networks to support religious leaders who know families facing problems with drugs and alcohol. KCDC also gives training to medical interpreters to enhance their skills and knowledge specific to counseling and chemical dependency treatment. Lastly, KCDC provides culturally-relevant health education materials on alcohol and drug use. To learn more about KCDC, contact Ta Da, Community Health Educator.